In June 2016, Dr. Liska graduated from the Oral & Maxillofacial Residency Program at Allegheny Health Network affiliated hospitals in Pittsburgh, Pennsylvania. He joined Northwest Oral & Maxillofacial Surgery in July 2016 and has been practicing in the Conroe and Huntsville offices of Northwest Oral & Maxillofacial Surgery. “I am extremely proud of this accomplishment. Having passed comprehensive written and oral certifying exams, attaining board certification acknowledges that I have met the highest standards of achievement in education, knowledge, and training in the field of Oral and Maxillofacial Surgery. Patients can be assured they will receive the utmost quality of specialized care and safety,” stated Dr. Liska. Dr. Liska is fully trained to perform the entire scope of his specialty, including wisdom teeth extractions, the placement of dental implants, bone grafting, orthognathic surgery and benign pathology. Additionally, he has trained extensively in the safe administration of IV anesthesia. 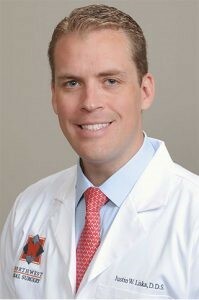 For more information about Justin W. Liska, DDS or Northwest Oral & Maxillofacial Surgery, please visit texasoralsurgery.com.